Selective removal of the conductive layer on TCO coated substrates. Most solar cell substrates consist of a Transparent and Conductive Oxide (TCO) coating on an inert material like glass. 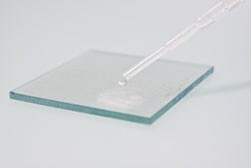 This coating covers almost always the entire surface of the substrates for easier manufacturing. There are cases however when it not desirable to have a continuous conductive layer all over the substrate. This is true for instance when building a solar module from serially connected cells, or when experimenting with stacked layer designs like monolithic cells or solid-state solar cells. Our TCO Etching Service will allow you to obtain custom substrates where the conductive layer has ben selectively removed according to your design.